I have created some dishes that I plan to serve at my own, personal Thanksgiving feast. I’ve tried to be original without creating an overdone Thanksgiving monster that no one will want to cook. Without further ado, I present my riff on traditional mashed potatoes. They’re almost as fun to cook as they are to eat. The fried sage is strictly optional/extra credit here. While it does add a huge flavor boost and a delicate crunch (not to mention the presentation value), this dish is still delicious without it. I have simply been trying to use as much fresh sage as possible before the frost kills my plants. This recipe appears very involved and time-consuming, but to be honest, if you make this, you will probably like it better than the turkey. Remove the sage leaves to a plate and reserve the sage-infused butter for another use. 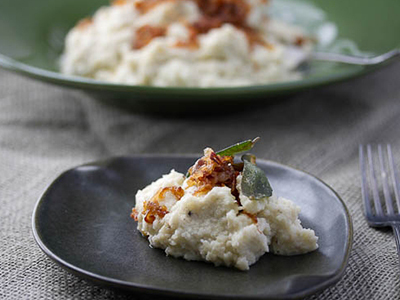 Spoon the cauliflower into a serving dish, top with the shallots, and serve alongside the sage leaves. Megan Scott is the newest member of the JOY clan. After meeting John Becker in Asheville, North Carolina, she was warmly welcomed into the family and the happy couple was married on September 29, 2012. After graduating with a degree in French literature, Megan worked in a bakery where she honed her pastry skills and developed a passion for high-quality baked goods of all kinds. This experience with fast-paced industrial kitchen work inspired her to create her farmer's market baking business, The Little Blue Baking Company. Megan's work for JOY involves a little bit of everything. 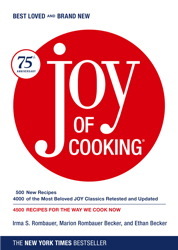 She is JOY's blogger-in-residence, she works with John on digital projects, newspaper articles, and food photography, and has spearheaded the Joy of Cooking's kitchen garden and flock of chickens. During her time off, she maintains a lively sourdough starter, sews, spins wool, and does yoga.